Description: This jutsu allows Naito to stay under water for as long as he wishes. The jutsu uses chakra to convert the oxygen from the water into air so he can breath while under the water without having to resurface. The jutsu needs only to be activated once in a battle and it will continue til the user's victory or death. Description: This technique requires a various amount of users. The users create a large storm cloud, which in turn produces rain. The large amount of rain then turns into a large wave of water and sweeps the enemy off their feet. While the targets are trapped in the water, their chakra will slowly be drained away. This also creates water for other jutsus. Description: This displacement technique is a specialty of the Ninja from Kirigakure, where one causes a mist to spring forth by lifting up some water, then goes in and out of sight at will from within the pearly-white realm. The mist's thickness is controlled by the amount of chakra kneaded into it. It can't fool the Byakugan, but, due to the mist being created with the user's chakra, any Sharingan-user will see the mist colored by their opponent's chakra, which will effectively hide the user from the dōjutsu. Description: The Water Clone Technique is similar to the Shadow Clone Technique except it creates clones out of water that have one-tenth of the original person's power. Like other solid clone techniques, the clones can be used to perform tasks the user is unable or unwilling to do for themselves. The range of the clone is limited however, as it can not travel very far from the original body without losing control. Like other clone techniques, if the water clones are injured enough they will revert back to normal water. Description: This jutsu is used to trap a victim inside a virtually inescapable sphere of water. The only downside to this technique is that the user must keep at least one arm inside the sphere at all times in order for the victim to remain imprisoned. This jutsu requires a sufficient amount of water, which can be provided by expelling it from one's mouth. Despite the fact that the prison is made up entirely out of water, it is stronger than steel as stated by Zabuza Momochi. Once trapped the target is unable to move while within it due to the heaviness of the water. Because of the density of the water it can be used, to a limited extent, for defensive purposes if performed on oneself. Description: This jutsu allows the user to create a torrent of water. Besides that, the user will be turned into water and lead his or her opponent into drowning. Description: This jutsu will grow in power with it's user. This jutsu enables the user to control water and moisture much like Gaara controls his sand. It can be used to block most incoming attacks, bind or drown opponents, and shape the water into various attacks, allowing the user in conjunction with the Summoning Technique to allow water-based summonings to fight in areas that it normally need water to move around by either trapping the target in the same water or maneuvering the water to allow the summing to chase the target. It is able to extract and utilize groundwater, and as is very effective most areas, but useless in rocky areas. Description: Using this jutsu, Naito gathers some water from the air and surrounding environment into one thousand long needles. He then directs them to a specific target at high speed, leaping backwards before impact so he doesn't get caught in the crossfire. While the needles do surround a target from all sides, they don't appear above the target, creating an escape route. Naito is able to perform this jutsu with one-handed seals, allowing him to pin an opponent's arm and attack while they cannot use any techniques themselves. Description: When the user is hit by an attack this jutsu will transform the user into water to avoid taking direct damage from any physical attacks. Description: The user launches a large jet of water from their mouth through their hand. This gives the appearance of playing a trumpet. Description: A technique that utilizes water to create a spinning water vortex around the user. The water vortex acts both as a barrier and an attack mechanism. The power of the vortex is enough to knock an opponent unconscious. Description: This technique will summon a large amount of water that will then be used to strike at the opponent in several versatile ways. Naito has been known to transform it into a dragon with a gaping mouth to attack. The water used will be stationary till it is sent offensively toward the opponent. Description: As the name suggests, this technique is simply a very quiet method of killing an opponent, usually from behind with a blade. Additionally, because the user is very silent, it cannot be defended against. The user will often slit their opponent's throat, preventing any cry that might give them away. The Seven Ninja Swordsmen of the Mist are said to be masters of this technique, and were even good enough to track and kill opponents through sound alone. Description:This jutsu is a high-speed movement technique, allowing a ninja to move short to long distances at an almost untraceable speed. To an observer, it appears as if the user has teleported. A puff of smoke is occasionally used to disguise the user's movements. It is accomplished by using chakra to temporarily vitalise the body and move at extreme speeds. The amount of chakra required depends on the overall distance and elevation between the user and the intended destination. Shisui Uchiha was feared as "Shisui of the Body Flicker" (瞬身のシスイ, Shunshin no Shisui), likely referring to this technique. Description: This is a custom scroll that Naito carries to hold his other swords. There are now 3 swords held within the seals of the scroll which are 2 of his personal creations and 1 of the legendary Swords of the Mist. These swords can be summoned at his own wish *Except Kubikiri Bōchō (首斬り包丁; English "Executioner's Blade"; Literally meaning "Decapitating Carving Knife") until Exam is over* Naito still carries The Shatter Blades on his body but will call upon these other blades if needed. *Name: Kiba Sutoraiki "Fang Strike"
Description: This set of swords are created from both a strong and extremely light metal but also from a unique poison that courses through the blades. The blades are actually hollow with vein like areas that holds the poison that is created from the users own chakra. Since the poison is made from chakra it causes damage that is unlike any other known but can be cured with time -2 Weeks- and the right antidote that is made in The Forsaken Country by this user and the 3 Heads of their religions. Abilites: This sword set is able to create a chakra system destroying poison from the user's own chakra. This poison can the added to the blade's edge for slices, Injected directly if able to stab or impale target or even sprayed in a mist from the blades themselves. Once poisoned the target will be able to create little chakra and by 5 posts unable to create none at all. It then attacks the main organs that are connected to the chakra system like the heart,brain or if wanted it will just destroy their chakra system to the point they are unrepairable. Then in 10 days death is certain if not countered correctly. Name: Suzumebachi No Danmaku "Hornet's Barrage"
Description: These katanas look like normal blades until one looks closely at the blades themselves. Instead of 2 solid blades these swords are made of 100 thin blades on each hilt. 1 sword's blades are conneted to metal wires to use for snaring,trapping, movement and cutting if allowed to hold for long enough. The other blade's 100 are not connected at all and can be used for both close and long range attacks. Description: This attack is used against ninjas who are great at blocking during weapon battles, Naito however will cause his sword to shatter when a opponett blocks the strike so the sword will shower his target with the smaller, spinning blades that is almost impossible to defend. Description: Naito uses both his swords in a single strike and releases the blades that form a cross like shape. The cross can be made small or big based on the area of the wanted target, These blades can cut stone and wind only cause them to become faster. Description: In this attack Naito unleashes either 1 or both blades in shatter mode at his target that moves at incredible speeds and can cut through most other objects. Description: With this jutsu Naito uses his Shatter Blades to create a metal dome for the use of protecting himself or allies. He can also use it to surround a target to keep them in place for another attack. Description: Naito uses this jutsu to help him extend his swords when their just out of reach of the blade's normal rank. This can be used also at close distances to impale his target or a couple of targets in a single strike. These bladess are Naito's main weapons and he can always be found with them on him. He had them created by The Sand Village's Blacksmith when he was 6 because he had a dream of them and knew that he must have them. He had both a Katana and Tanto made but instead of being fully solid the blades are created like a puzzle of sharp metal pieces. What makes these weapons so special is that during swings the blade can shatters and be sent as projectiles or after a block Naito can shatter them for a close projectile hit. The blade reforms by itself and can be as dangerous returning as they are sent out. The sword can stand to any other weapon even with it's unique design. Name: The Nuibari (縫い針; Literally meaning "Sewing Needle") is one of the swords of the Seven Swordsmen of the Mist, wielded by Kushimaru Kuriarare. The blade itself assumes the form of a narrow "longsword" (長刀, chōtō) that greatly resembles a large needle, with a long length of thin wire mirroring thread, tied to the eye located at the base of its hilt. This sword is said to possess the ability to pierce all and stitch them together, demonstrated through its ability to effortlessly penetrate multiple targets in a single thrust and then quite literally stitches them together in substantial bundles, by simply pulling the attached wire taught. A capable user can even throw the sword with the intent of piercing a line of multiple enemies, before catching the needle at the other side and repeating the process at different angles, in order to create knots of corpses with the wire passing through the entirety, effectively creating bundles of bodies at various points along the length of the thread. The sword is first seen when a revived Mangetsu Hōzuki summons it from a scroll, where it is then returned to its respective wielder, Kushimaru. Name: The Kubikiribōchō (首斬り包丁; Literally meaning "Decapitating Carving Knife") is a massive broadsword shaped like a giant butcher knife, passed down from generation to generation amongst the Seven Ninja Swordsmen of the Mist. It has a circle cut out of the top and a semicircle near the handle, which, as demonstrated by Suigetsu Hōzuki, seem to fit the sword's purpose of decapitation aptly, and the latter gives something to wrap a back strap around, in order to carry the weapon. Its extremely long handle is detachable: Suigetsu was shown screwing it off before travelling and reattaching it for combat. Suigetsu, despite being well-trained, noted that the heaviness of the blade could tire him out easily; a problem Zabuza Momochi didn't have. Like every other weapon used by the Seven Ninja Swordsmen of the Mist, the sword possesses an unique power, this being its ability to reform itself using the iron harvested from its victims' blood. This regenerative process takes place almost instantly, and is capable of bringing the weapon back to its original perfect condition no matter how severe the damage is, from a simple chip or a nick to a completely missing half of the blade. This giant blade was said to have been used by Mangetsu Hōzuki, but was the trademark weapon of Zabuza during his time as one of the Seven Swordsmen of the Mist. After defecting from Kirigakure, he continued to use it up until his death. It was left beside his grave until Suigetsu took it for himself three years later. In the manga, Suigetsu simply takes the blade from Zabuza's grave. In the anime however, after Zabuza's death, the blade was stolen by Tenzen Daikoku, a crime boss who lost many men to the blade, as a trophy, and was used by one of his bodyguards until Suigetsu took it forcefully. During Taka's fight with Killer Bee, Bee cuts into the Decapitating Carving Knife, damaging it. When later fighting the Fourth Raikage, the Raikage snaps the blade along the same cut-line that Bee created. Despite being cut in half, Suigetsu continues to use the blade, which now resembles a cleaver. The sword is taken from him when he is captured by samurai. He tries to locate the sword when he escapes, but cannot find it anywhere. Shortly afterwards, during the clash between Kabuto Yakushi's forces and the Third Division of the Allied Shinobi Forces, the sword is shown having been returned to a revived Zabuza, who starts striking down many enemies with it in order to reform its broken blade. The blade is fully reformed when Zabuza wounds Kakashi, who had been immobilized by Haku. Later the blade is seen in Kakashi's hand after both Haku and Zabuza are sealed. Name: The Kabutowari (兜割; Literally meaning "Helmet Splitter") is one of the swords of the Seven Ninja Swordsmen of the Mist, wielded by Jinin Akebino. The sword itself consists of a giant axe and hammer, linked end-to-end by a flat thin leather-like rope, which together are referred to as a "bluntsword" (鈍刀, dontō) that is said to be able to break through any defence. Although the length of cord means each weapon can be utilized individually, to cut and crush obstructions respectively, their true strength lies in their capability to be employed in conjunction with one another. When facing a particularly difficult or seemingly impenetrable defence; the wielder can first attack by striking with the axe, before slamming the hammer downwards onto its blunt backside, thus using the blade like a wedge to drive straight through the offending obstacle and into the desired target located behind. The sword is first seen when a revived Mangetsu Hōzuki summons it from a scroll, where it is then returned to its respective wielder, Jinin. Name: Shibuki (飛沫; Literally meaning "Splash") is one of the swords of the Seven Swordsmen of the Mist, wielded by Jinpachi Munashi. The blade utilizes various exploding tags, contained within a substantial scroll, in order to incorporate explosions into the user's own swordsmanship, earning it the title of "blastsword" (爆刀, bakutō). The sword itself features two distinct sides, with a narrow cutting edge located down the entirety of one length and a wide platform section on the other. The aforementioned scroll unrolls along this latter side, sliding downwards and resting atop its surface to form an individual segment comprised from numerous exploding tags, which separates from the remainder upon detonation. Only once the desired opponent comes into contact with the platform, do the exploding tags finally ignite and then detach, providing a small opportunity for the user to escape the devastating blast radius, while simultaneously compensating for any resultant recoil. The sword is seemingly able to reload another segment of tags onto the platform, automatically after each strike. The sword is first seen when a revived Mangetsu Hōzuki summons it from a scroll, where it is then returned to its respective wielder, Jinpachi. Name: Samehada (鮫肌; Literally meaning "Shark Skin") is a large living sword comparable in size to the Kubikiribōchō. It is described as "the most terrifying of all the Seven Swordsmen's blades". At the tip of Samehada's handle is a small skull. Its actual blade is covered in scales, which causes it to inflict shredding or shaving damage rather than cutting what it comes into contact with. The effect is similar to a shark's skin, hence its name. While it ordinarily remains rigid, Samehada is able to stretch and bend to a great extent, allowing it to be used like a flail. 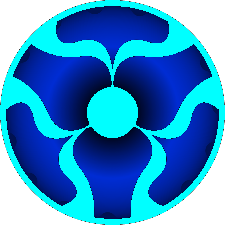 Samehada is unique for being a sentient weapon that gains nourishment from the chakra of others. The blade is happiest when engorged with chakra. Although it constantly feeds off of the chakra of its owner, its largest "meals" come from fights wherein it absorbs the chakra of its owner's opponents. Such an ability allows Samehada to literally slice through an opponent's technique and even prevent techniques from being performed by absorbing all of the opponent's chakra. This is particularly useful when fighting jinchūriki, as Samehada can quickly deplete their large chakra supplies as well as remove their chakra cloaks. Samehada grows larger from the chakra it absorbs, its scales becoming longer resembling shark fins and its mouth, located at the tip of the blade, becoming more pronounced. Keeping Samehada wrapped in bandages apparently inhibits this growth. However, it seems to be unable to automatically absorb ambient chakra, all instances where it's absorbed chakra are when his opponent had a visible aura around them. While the ability to absorb chakra is useful in defeating opponents, it is also beneficial to its user. Samehada has the ability to transfer the chakra it has absorbed to the wielder by partially fusing with its wielder, so it can be used to either heal the wielder's injuries or replenish their chakra reserves. This makes the wielder of this sword extremely difficult to defeat. It is drawn to others with large chakra supplies, allowing it to be used as a sort of sensor. A wielder of this sword, such as Kisame Hoshigaki can take this fusion one step further by completely merging with Samehada. Doing so causes him to become much more shark-like in appearance, growing fins and webbed hands that allow him to move through the water with greater ease. Kisame receives some of Samehada's abilities while in this form, such as being able to extend spikes form his body for attack, and absorbing chakra when others come into contact with him, as well as the ability to track chakra. As a sentient weapon, Samehada chooses its user. If someone it disapproves of tries to wield it, spikes protrude from the handle, forcing them to release it, and Samehada returns to its chosen owner. After Kisame killed its former wielder, it came into his possession. The two had a long history together, leading Kisame to become regarded as a "tailed beast without a tail". They were together for so long in fact that their chakra signatures even became identical, which Kisame uses to his advantage on one occasion to hide within Samehada and avoid detection by sensors. During Kisame's fight with Killer Bee, Samehada grows fond of Bee's chakra and betrays Kisame, giving Bee back some of the chakra it had absorbed from him during their battle and even shielding Bee from Kisame's attacks. Despite this, Kisame is able to force Samehada to cooperate with him, allowing him to hide within it to infiltrate Kumogakure as a spy and forcefully use it to absorb Bee's chakra. After Kisame's death, Samehada actually cries for him giving even more lifelike characteristics to the blade. Name: Kiba (牙; Literally meaning "Fangs") is a set of twin swords of the Seven Swordsmen of the Mist. They each have been imbued with lightning, displaying enhanced cutting power in a manner similar to the high-frequency vibrations of lightning-based chakra flow. It is this capability that has resulted in these "thunderswords" (雷刀, raitō) being claimed as the sharpest swords in existence. These weapons were first introduced in the anime, shown in the possession of Raiga Kurosuki, who uses them to instead channel his own respective Lightning Release techniques and to conduct natural lightning. The swords could also be connected at the hilts to form a larger double-bladed sword. Ultimately, both were left behind at the bottom of a river in the Land of Rivers, after Raiga's death. The swords are later adapted in the manga, where they are summoned by a revived Mangetsu Hōzuki with a scroll and then returned to a similarly resurrected Ameyuri Ringo, both of whom are previous wielders of the blades. Their abilities are fundamentally the same as they were in the anime, though it has yet to be seen if they can be connected too or perform lightning based techniques. Name:Hiramekarei (ヒラメカレイ) is a double-handled sword wielded by Chōjūrō. The Hiramekarei has two holes in the upper end of the blade that shoot out chakra, which can seemingly be formed into weapons such as a hammer. However, it is apparently heavy, as Chōjūrō tires easily from carrying it But Naito use it quite easily. According to Suigetsu, this is the only sword still in Kirigakure's possession out of the original seven blades. Suigetsu also noted that his brother Mangetsu mastered the use of this sword. Abilities: The first of the Sharingan's powers is being able to see the flow of chakra. The Sharingan can tell if a person is under a genjutsu because the person's chakra flow would be irregular. The Sharingan's second-most prominent ability grants the user an incredible clarity of perception, allowing them to easily recognize genjutsu and different forms of chakra, though not to the same extent as the Byakugan. This also allows the user to pick up on subtle details, enabling them to read lip movements or mimic something like pencil movements. As the Sharingan evolves, gaining more tomoe seals, this ability extends to being able to track fast-moving objects before finally giving some amount of predictive capabilities to the user. However, even though the user may be able to see an attack or know it is coming, their body may not have time to react. The Sharingan's third and most well-known ability is that it grants the user the ability to memorize any technique that he or she witnesses, apart from other Kekkei Genkai techniques. The user can memorize ninjutsu, genjutsu, and taijutsu with near perfect accuracy, allowing the user to use the techniques as their own, or even modify them to create their own new techniques, much like Sasuke Uchiha's Lion Combo. In order to reproduce a copied jutsu, however, one must have the necessary skill or ability to perform them. A prime example is Rock Lee's brand of taijutsu. While Sasuke was able to copy some of Lee's moves, they put a much more significant strain on him since he hasn't trained nearly as much as Lee has. In addition to physical skill and kekkei genkai techniques, the Sharingan cannot reproduce jutsu dependent on other factors, such as summons that the user has not signed a contract with. The Sharingan's final commonly-used ability is capable of inducing a unique brand of hypnosis that involves suggesting actions and thoughts to the opponent through genjutsu cast by simple eye contact. More advanced Sharingan users can take the hypnosis ability even further to the point where a powerful summon like Manda or even the Nine-Tailed Fox may be controlled. When this was used against Manda and the Nine-Tailed Fox their eyes took on the tomoe pattern of the users' Sharingan while under hypnotic influence. The hypnotic ability coupled with the other aspects of the Sharingan, can make the user appear as if they can "see the future". First, the user must perfectly mimic every move their opponent makes and possibly their thoughts and words through careful observation. Then, they suggest an action to the opponent such as hand seals for a jutsu that the opponent and Sharingan user already know and copy that. With these things done, the user can complete the action even before the opponent does, possibly using the Sharingan's genjutsu to confuse or delay them. As with other genjutsu, genjutsu cast by the Sharingan are capable of putting an opponent to sleep, inducing paralysis, replaying memories to someone else, or creating various illusions to deceive someone. The potency of the Sharingan's illusion is dependent on the user's knowledge and skill with implementing genjutsu. In addition to these commonly used techniques, the Sharingan allows the user to perform the genjutsu Izanagi. Using Izanagi, the user can warp reality for a short amount of time, changing reality into illusion and illusion into reality. However, this technique has been dubbed kinjutsu, because use of it causes the user to go blind in the eye that performed Izanagi. Although the Sharingan consumes the user's chakra while active, the chakra levels that the user must exert is so insignificant that they can keep it active constantly. In fact, Itachi Uchiha was so masterful of it, he was able to keep it active for most of the time, only once deactivating it after using Tsukuyomi on Sasuke and Amaterasu to escape Jiraiya. Description: Izanami, named for a goddess who helped spawn many islands and deities, is a Genjutsu technique which was declared a Kinjutsu by the Uchiha Clan. Using Izanami grants the user the ability to turn wounds and disadvantages into nothing more than dream. It also makes attacks and advantageous maneuvers real, thus giving one complete control over their own reality through an illusion cast on themselves. Izanami is is a similar to the jutsu Izanagi but can be considered to be weaker and yet stronger at the same time. While this might not be able to stop an attack that could kill you like its brother could it also doesn't impermanently take away the user's eye(s) but will instead close an eye for each time its used for a total of three days. Description: This jutsu allows Naito to control one of the 9 beasts but once he uses this jutsu he is linked to that certain Bijuu forever. The jutsu simply requires eye contact with the beast and a bit of time to use the needed chakra to put the beast in a dream like state. In this state he is able control the beast at will and use it as even a summon if he wishes but once let loose of the jutsu the beast will go berserk and trie to destroy all in site. Name: Kuroi Kawa "Black River"
Description: This Jutsu allows Naito to see through a person into their soul and see everything from their life memories, techniques they know, if their lying or telling the truth or even what they are thinking at the time they are caught in the jutsu. The person can still do whatever they want but with the knowledge gained from this jutsu it makes Naito a even more dangerous ninja. To activate the jutsu Naito only has to have the target look into his eyes while they glow blue. Description: This jutsu allows Naito only after he has cut his target with his sword to exchange places with them instantly. This can be used to put his targets in the line of fire of jutsu sent after the Kuki with no way to stop it because they jutsu only transfers when Naito is put in a postion that he can't get away and the attack will surely hit. This jutsu can also be used for kidnapping or to infiltrate areas that just trying to sneak in is impossible by getting the blood of someone or some living creature that can get into the place without setting off alarms or causing unwanted attention until he is already in the place that he chooses. 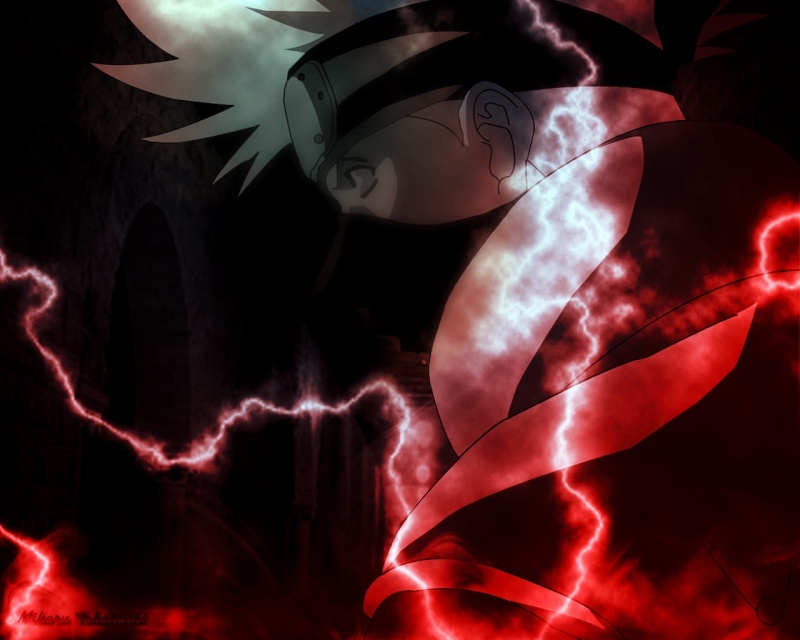 However he uses the jutsu in battle mainly to have his target hurt themselves with their own techniques and Taijutsu attacks will still continue but the person who exchanges places with Naito will reappear with their back to the Kuki.